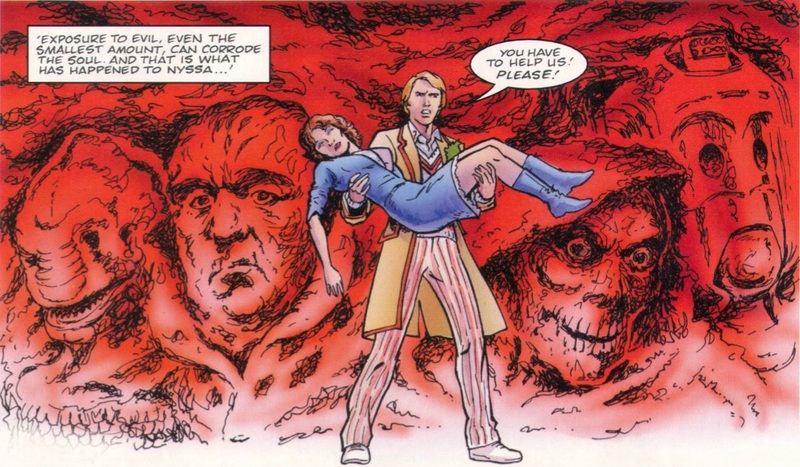 ‘Nyssa will die at dawn, and the Doctor doesn’t even know why. 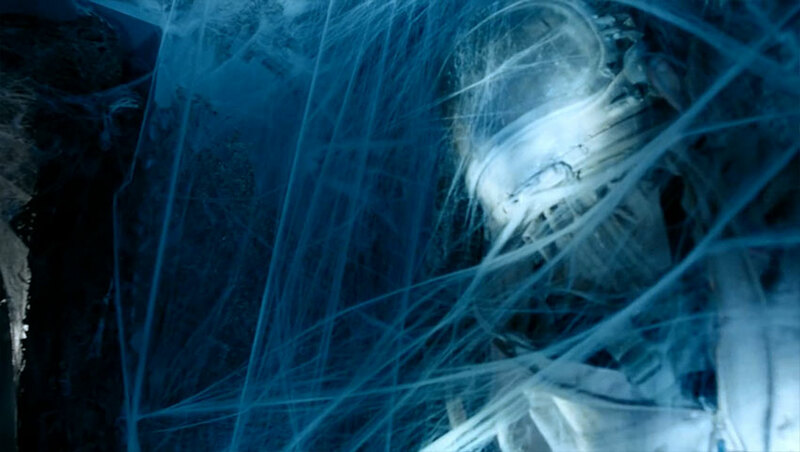 To save her life, he must make a desperate journey to the only place in the universe where a cure might exist. When even that fails, the Doctor has a choice – let Nyssa die, or make a deal with the devil. It’s been a while since I’ve done one of these reviews!! I think one of the biggest shames in all of 80’s Doctor Who was cramming so many characters into Peter Davison’s TARDIS so that there wasn’t really a way for any character to really stand out. For me, usually these characters stood out for the absolute wrong reasons – Tegan and Adric always arguing with The Doctor for no reason then getting hurt because they ignored something he told them to do absolutely irks me. I always wanted more Nyssa and Turlough! With Big Finish Audios my prayers have been answered as some of these pairings were given new adventures to play around with, and it’s really making me LOVE parts of Doctor Who that I wasn’t a fan of with the TV show. Case and point, me flipping my opinion on both Peter Davison and Colin Baker’s runs on the show. 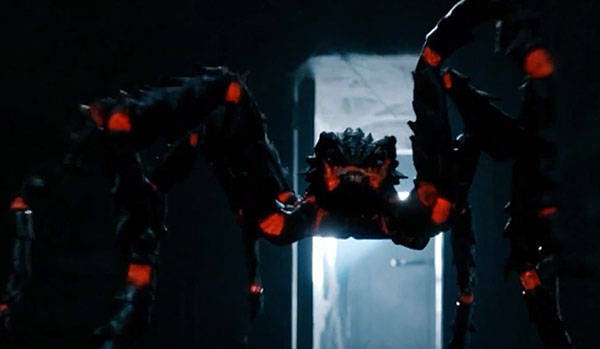 When Doctor Who tackles larger than life God-tier villains, it’s always a bit hit or miss for me. Most of these episodes have some sort of ham-fisted agenda either vilifying religion or somehow propping it up. Then in some really weird cases, it somehow does both. sometimes I end up absolutely loving such episodes much like what happened with The Rings of Akhaten, or it could go south in episodes like just about any that have “The Devil” in them. I think my leanings towards Gnosticism tend to make me predestined to get excited about stories where mortals stand up to self-described deities, so there is that. Usually, episodes like this have a Stargate vibe where ancient aliens have been worshiped as gods when they are not. Luckily, this story flips this trope on it’s head a bit by coming to a planet where the is basically no religion whatsoever, only to discover that the planet was basically founded by a creature named Kwundaar that in many ways was their god until they decided to lock him out. Inadvertently, The Doctor tries to help Nyssa but accidentally helps Kwundaar once again become the God-king of Traken. There’s a bit of a jab at organized religion where suddenly people convert to worshiping the creature simply to save their own lives. One thing I enjoy a lot about this episode is that it fills a few gaps into the Doctor Who continuity. This story portrays the planet Traken three thousand years before TV: The Keeper of Traken. It also tells how the Keeper’s position came to be. Having some backstory to this and showing how the society was set up was a nice touch. Another nice touch was finally explaining why Nyssa collapsed in an old TV episode, Four to Doomsday, and how she magically obtained telepathic powers in Time-Flight. It appears that both are direct results of Kwundaar’s manipulations. I also enjoyed that The Doctor was able to defeat Kwundaar in a way that was not a cheat or a contrivance. With a lot of episodes like this resulting in something silly like “love saves day!” I’m glad that didn’t happen. My apologies for being so behind on these reviews! My plan was to watch and review each of these on Sunday, but boy did that get away from me. Nonetheless, let’s get down to business. Season eight of Doctor Who continues to be pretty awesome, and while there have been a few merely average episodes this season, I’d say it has been the most consistent season since Matt Smith’s season five. So far, my favorite story has been Listen, which was a total surprise to me because I didn’t expect to enjoy it much. So, why am I mentioning this during my review of Kill The Moon? It’s because I didn’t think I’d enjoy Kill The Moon prior to the moment I started actually watching it. I thought something like: “Not only does it have a silly title, but what could the premise possibly be?” and “that child actor is in this…uh oh!” I should do this prior to everything I watch, because BOY was a mistaken. 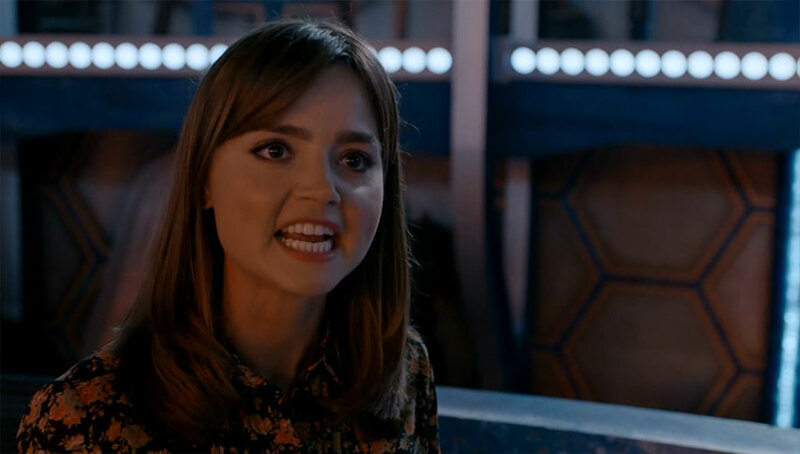 Our episode begins with Clara speaking on behalf of Courtney Woods, the girl from the previous episode – The Caretaker, attempting to rejoin The Doctor within the Tardis, or to at least clean up the horrible mess she made when she was last there. The Doctor decides to take them up on the offer and go on a “field trip of sorts”. This trip lands them on a one-way suicide mission to The Moon via a re-purposed space shuttle filled to the brim with nuclear warheads. It seems that in 2049 tides got out of hand killing much of the Earth’s population. Not sure what was really going on, the earth somehow decided that it was a great idea to nuke the moon for a chance at survival. It is discovered that the moon is actually a huge egg that is about to hatch, and the moral implications of killing a huge “space baby” for no reason other than fear upsets Clara quite a bit. The Doctor is willing to let this transpire, but he wants no involvement in the decision – leaving it up to Clara, Courtney and The captain of the mission to figure out the fate of the moon – and possibly humanity. The “monster of the week” for this episode is actually pretty horrifying and should play on anyone with any sort of arachnophobia. There are some truly unsettling things on the moon like the deaths of multiple supporting characters and web-covered corpses strewn about for quick jumps. I’d imagine that this is an episode that would freak little kids out pretty bad, because I recall being horrified by the titular hand in The Hand of Fear, and that was a cheap special effect in comparison to these guys. Not only are the “Spider-germs” pretty menacing in appearance, but their brutality is so inhumane that it’s unsettling. It was sort of silly that they were fought off using Windex and flashlights (it’s revealed that they are evolved bacteria essentially), but I guess other films have done stuff like that to critical success, so I’ll try not to be too cynical. Thankfully my fears about Ellis George reprising her role as Courtney Woods were not realized. I’m not going to say that she blew me away with her acting ability, or that she was the highlight of the episode, but she at least kept from annoying me. Sometimes it’s the small things that count! Child actors usually get placed in shows like this as the “moody genius kid” or “sassy street-wise kid” and become almost insufferable ten minutes into their first appearance. Courtney is no Wesley Crusher or Adric thankfully, as she doesn’t simply exist to be sassy and spout one-liners or try to make other characters look dumb. We once again are faced with the question as to whether The Doctor is a good man or not, and this seems like the ultimate iteration of this ongoing theme. Channeling his inner Seventh Doctor, The Doctor seemingly ends up abandoning everyone in order to force them to choose whether or not to blow up the moon. This is sort of similar to that time Sylvester McCoy‘ Doc treated Ace like garbage to get her to loose faith in him in order to defeat the monster in The Curse of Fenric. Peter Capaldi is once again very awesome, and usually straddles the line between being hilarious and terrifying at the drop of a hat. Clara once again yells at the Doctor in this story, and while I like the character development I hope this begins to be the end of this theme. The Doctor is a jerk, yes, but we have seen him warming in the last few episodes to a degree that I just want them to be friends now. I did get sort of irritated when I ventured online to gauge what the general fan consensus to this episode was like. Most seemed to enjoy it, but a loud minority seemed determined to hate it because of the scientific implausibility of the the whole thing. Sure, it’s weird that the moon was revealed to be a giant space egg, but it’s not like Doctor Who is particularly “hard” on the scale of what sort of science fiction it is, it’s always been more of a space opera. But there I was, knee-deep in annoying comments saying “the classic series was ONLY grounded in science!!”. This is laughable, because I can immediately think of TONS of older episodes with laughable science. Hell, my favorite Hartnell episode, The Dalek Invasion of Earth, centers on the premise that the Daleks have somehow made it to Earth because Earth is the only planet with a magnetic core. What followed was a plan that involved hollowing the earth out and flying it around like a spaceship. So any notion that, prior to 2005, Doctor Who was in a similar vein to something like Gravity is, quite frankly, laughable. This episode is pretty notable for how amazing it looks, considering I’ve seen big budget films that do a worse job of conveying the lunar surface than this. The episode was under the helm of two newcomers to the show, as it was written by Peter Harness and directed by Paul Wilmshurst. They are both formerly BAFTA nominated industry veterans, so it seems like a great choice to bring them both on board. Many lunar shots were filmed around a volcanic area in Lanzarote, Spain, which seems like a great stand-in for the actual lunar surface. It’s at least a far cry from the “rock quarry” planets we get used to in many science fiction TV shows. The story is also pretty intelligently written, seeing that it seems to be a commentary on our penchant to kill anything we don’t like, issues with funding for space travel, and to a lesser degree – abortion. These are all pretty mature themes for a show like this, and I felt that it was handled in such a way that adults can see these sorts of things, and kids will just enjoy the monsters. 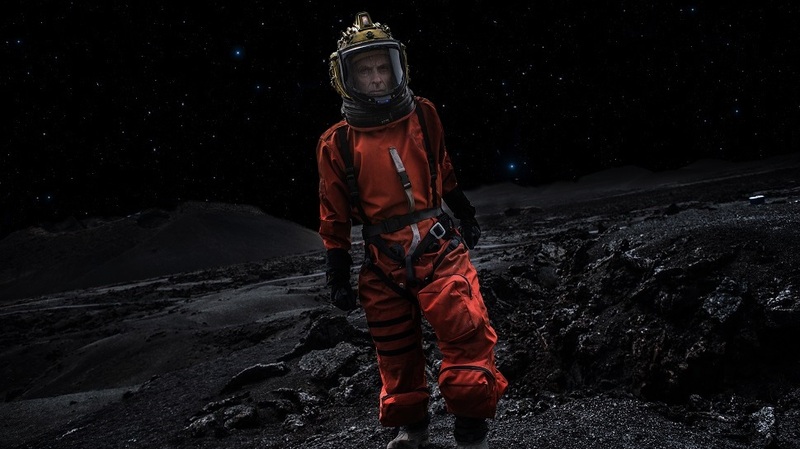 In the episode, The Doctor reveals that because of the brief re-interest in what happened with the Moon, humanity would be rekindled to travel to the stars, helping them to spread across the universe, and then assures Lundvik that she will now have a real space program to lead. With constant set-backs to manned space travel as of late, I can see Lundvik’s space travels in a very similar vein to how it is now – we don’t travel out of wonder or discovery, but because of the opposite. 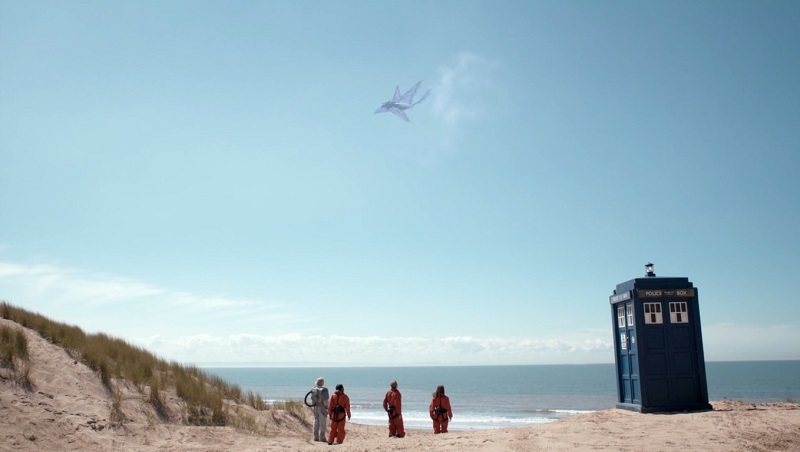 It’s a pretty epic ending to a Doctor Who episode, and makes me wish a similar thing would happen in real life – minus the apocalyptic tsunamis of course. As you can see, I really enjoyed Kill the Moon. I think it’s another one of those episodes, like Listen, that seemed like it was going to be a totally different thing than what it ended up being, and it’s this playfulness with the format of the show that has made me love season 8. In fact, the few times I thought an episode was sort of lame, was when they followed older conventions to a fault. 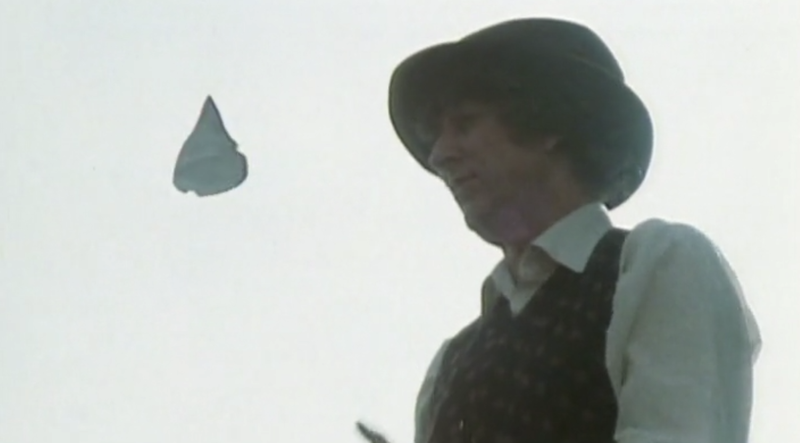 I loved all of the throwbacks to Tom Baker, especially small partial quotes that he was notable for like “Earth isn’t my home” and his use of a Yo-yo as a scientific experiment. The next episode looks amazing,so I’lll end my review here, and hopefully I’ll get caught up before this run of episodes stops! Full disclosure here: In all honesty, I’m not much of a fan of vampire fiction. While I would say that Nosferatu is, quite possibly, one of my favorite horror films, anything after the 1950’s is pretty hit or miss for me. Things that “try something different” with the legendary creatures like Hellsing, Vampire Hunter D, I am Legend or even Lost Boys are fairly interesting, but exists as diamonds in the proverbial rough of all of the other vampire stuff. I especially am not a fan of the more “romantic” side of vampire fiction, meaning that anything from Anne Rice novels to True Blood aren’t necessarily bad, but are not my most favorite thing to watch/read/ listen to. So imagine my apprehension when I come face to face with an audio drama that is not only about vampires, but has the word “Twilight” smack dab in the center. If there is anything that I don’t like it’s a story of pre-pubescent love between a vampire werewolf, and a caricature of a high school girl, but I digress. Doctor Who has tackled vampires before, to varying degrees of success. We have seen things like fairly classical vampires in State of Decay, fish monsters that have fangs in Vampires of Venice, or grotesque mutations with a taste for blood as in Cure of Fenric. I think one of reasons I’m not too enamored with these stories is that they go leagues out of their way to explain common vampire tropes like an aversion to garlic, thirst for blood, and sensitivity to light all with a scientific slant. This has been done so often since 1954’s I am Legend that it almost seems silly at this point; it’s quite similar to how contrived many of the “origin stories” for zombies have become. In the 50’s, Richard Metheson breathed new life into a tired genre by making his vampires somewhat science-based, 60 years later it’s yet another tired cliché. I honestly can handle these mythological creatures, there doesn’t need to be an elaborate background of expositionary dialogue to set everything up. In Project: Twilight we find ourselves knee deep in just such a situation, with vampires being explained in a silly way. It appears that the ‘Twilight’ vampires were a form of botched scientific experiment, having been humans (typically prisoners or war wounded) created during the First World War by the Forge, a top secret government initiative to research means by which a superior soldier class might be engineered. So basically, the vampires in this episode are like a messed up version of Captain America. The reason The Doctor and Evelyn end up coming face to face with this situation is The Doctor’s hunger for what he says is the best Chinese food in all of the galaxy, located in the most unlikely place – a dockside in south-east London. He assures Evelyn that he has sat for dinner with the legendary Kublai Khan, and not had Chinese take-out as good as this restaurant – The Slow Boat. Once they are chowing down on MSG-filled wontons and noodles, they discover the remnants of what can basically be called a “nest” filled with carcasses of brutalized small animals and other refuse. Next thing you know something like a mafia hit appears to happen nearby, and The Doctor and Evelyn are stuck in the middle of another bad situation. We are introduced to the staff of a shady nightclub and casino called Dusk, run by a man named Reggie Mead who is obviously in some sort of organized crime syndicate boss, oh and a vampire. Other characters are varying degrees of likability, but a character name Nimrod stands out the most. he is described as an older man, donning all sort of futuristic vampire hunting technology. He is apparently nearly one-hundred years old, and was a twisted scientist in his past. He was mortally wounded and had to inject himself with the very same serum that created the vampires in the first place, cursing himself to hunt the earth for his own kind. My mind immediately slipped to the Marvel comics character Blade, who was a vampire himself, and yet hunted other vampires. 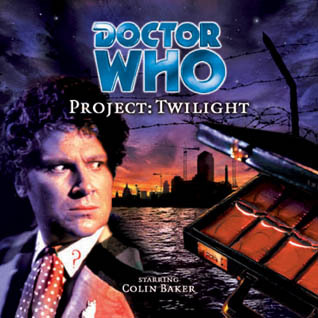 I liked Project: Twilight for what is was, but it’s not my favorite entry of the Big Finish line. Try as I might, I just have trouble enjoying vampire stories as much as other people and I’m not sure why. I like the inclusion of the shady governmental organization Forge and Nimrod, and hope they show up up again in a later installment. Much like with a few of the New Adventures related Sylvester McCoy dramas, I disliked how gory this episode was. I am not squeamish to this sort of thing, but I don’t see Doctor Who as the prime place for exploding people and vampire torture with added “squishy organ” sound effects. I originally didn’t finish this drama a few years ago because it got silly towards the middle with this stuff, and I was especially burnt out on vampire stuff having worked at a retail store when those Twilight books and films were coming out. On the second listen I’m glad I finished it, and I would say that it’s above average. As you can see from the title, this post is largely unrelated to the main theme of this site, and happens to be a convention report. Thankfully, as you can see from the image above, there was definitely some UK science fiction fun to be had! Yeah, that ugly mug up there happens to be mine, and standing next to me is none other than Sylvester McCoy aka The seventh Doctor aka Radagast The Brown. 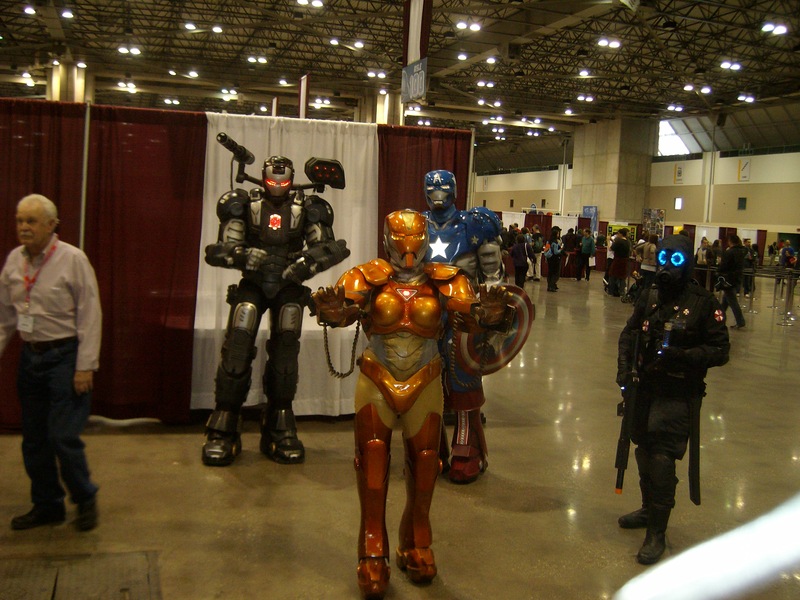 Said convention was a Kansas City-based convention called Planet Comicon and it was held in downtown Kansas City, Missouri. 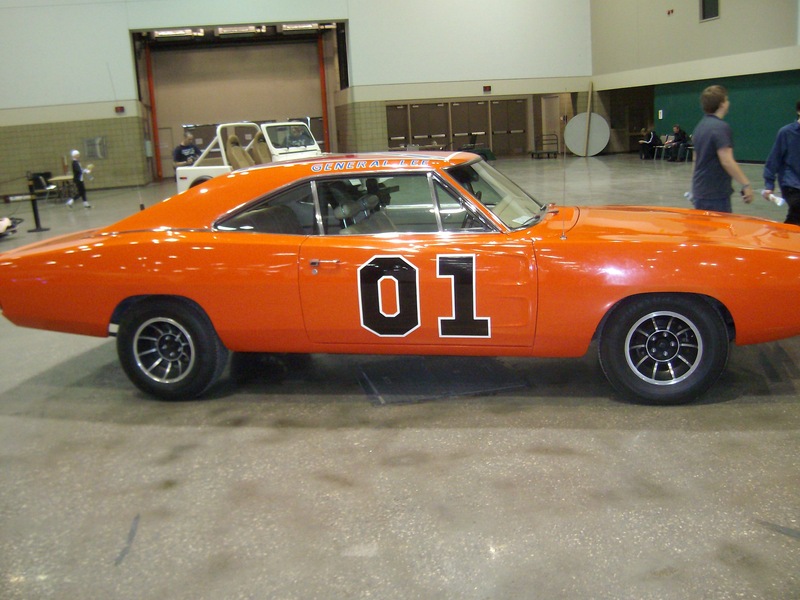 The reason I decided to write about this on here, is that personally, I think there is some cross-over appeal from sci-fi fans and those who go to “comic-cons”, because in all honestly they aren’t just about comics anymore. Thankfully I live in the middle of Missouri, and Hollywood has never swooped in on our conventions, so it’s not like it has deviated too far from the main purpose of these types of conventions. There are panels, media guests and comic book writers and artists like anything else, minus all the BS that seems to have been messing up much larger events like San Diego Comic Con. For years, I have always attended anime conventions because part of me (erroneously) assumed that my local comic conventions were nothing more than small dealer rooms that you paid to get into. 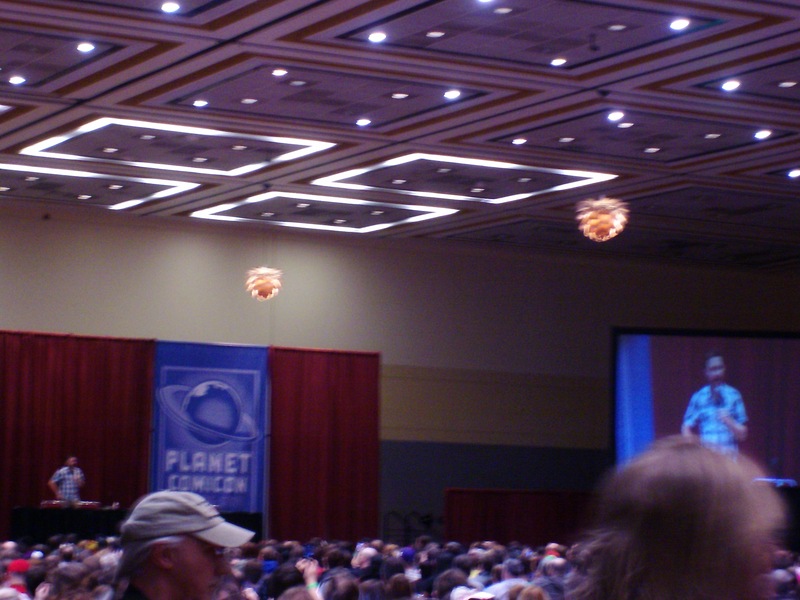 When I heard that Planet Comicon was going to be held at Bartle Hall, a huge convention center, I immediately took notice. 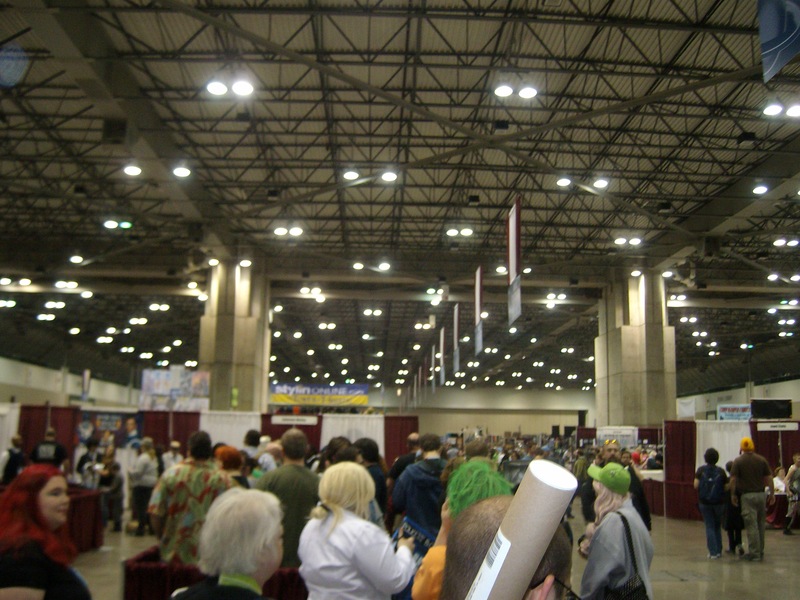 I think the biggest con I attended was an anime convention in Dallas Texas (Project A-Kon) that had something close to 10.000 people attending, and considering the size of the building plus the sheer amount of people at Planet Comicon that I saw, I’m assuming that this one will be bigger when all the numbers are added up. The paper was suggesting almost 20,000 minimum! One reason I don’t attend too many of those aforementioned anime conventions is because of my age. I’m 31 now, and most anime convention attendees seem to be somewhere between 12-17. Not to be one of those “get off my lawn” types, but the younger millennial crowd sort of annoys me, and having thousands of them left unsupervised means that I get to witness things like pulled fire alarms, trash all over the place, hormonal kids making out in hallways, and other fun stuff. A Comic Con crowd is skewed much older, and as a result the rude people are heavily outweighed by awesome people that can handle themselves in public. 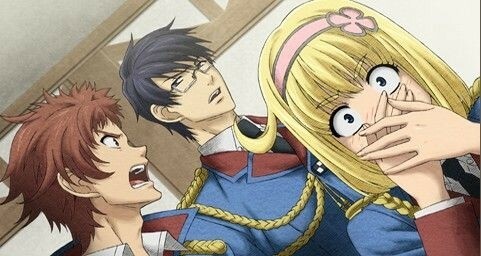 Aside from that, the MAIN reason I honestly stopped going to many anime conventions was the fact that I really enjoy panels, and at anime convention panels are REALLY hit or miss. Occasionally one stumbles upon something good, like the year I saw the world premiere and Q&A of Robotech: The Shadow Chronicles. Other times were not as good, like that time I had to sit through two awkward twelve year olds attempting to run a panel on Japanese horror films, and my quest to try to sneak out of the room as politely as possible. Margot Kidder of Lois Lane fame. I attended some pretty cool stuff this year, most of which was related to Star Trek: The Next Generation. This was because this convention had basically all principle cast members from TNG including Marina Sirtis, Levar Burton, Wil Wheaton, Jonathan Frakes, Michael Dorn, Gates McFadden, and Brent Spiner. Also in attendance was the Star Trek God himself William Shatner and an unannounced John De Lancie! The convention did advertise a special moderated panel featuring all the the Trek guys, but I could not afford tickets to it. Good news is, most of these guys had smaller panels themselves. The first panel I attended was a Q&A session with the Canadian-American “scream queen” and occasional Lois Lane herself – Margot Kidder. This was a guided Q&A (Moderated by a member of scifi4me.com) with an interview of sorts at the beginning and audience questions afterwards. Some gems were discussions on how Kidder got started in a tiny Canadian mining settlement mere miles from the arctic circle and her occasional flings with the likes of Warren Beatty and Jeff Bridges. Superman was, of course, a main topic towards the end of the panel, and Kidder suggested that she understood the torn fandom on the latest Superman offering suggesting, that the newest movie was perhaps “too dark”. All in all, pretty cool panel. 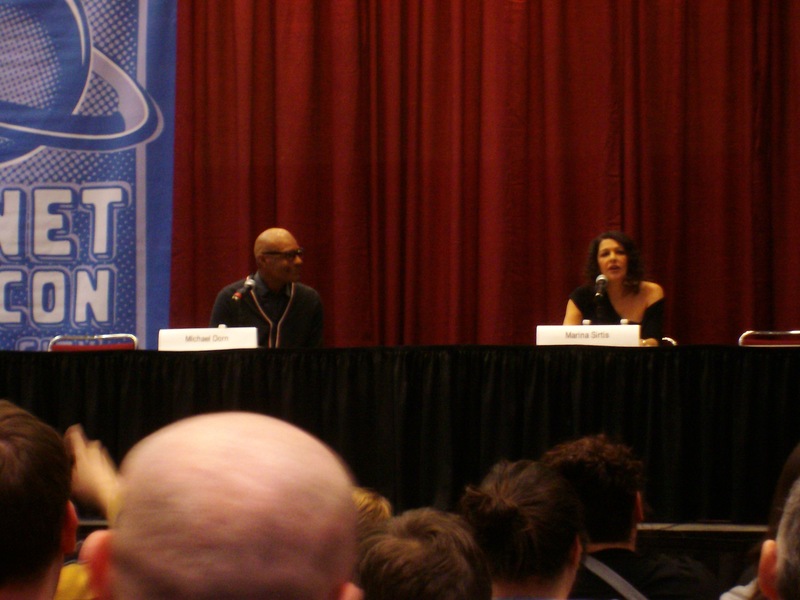 Up next for us was a Star Trek related panel featuring Michael Dorn and Marina Sirtis in the hot-seats. As Trek fans will know, they played Deanna Troi and Worf on TNG. This was more of a full-on Q&A and started with some lighthearted banter between the two at the beginning. Sirtis cracked me up because I’m VERY used to her calm demeanor as Deanna Troi in TNG, so hearing her coarse, no-nonsense verbal attacks on various topics was pretty fun. On the flip-side, Mr. Dorn was “the straight man” of the affair, and tried to keep everything on topic. The running joke of this panel was that Marina kept bringing up how somebody had told her to be “sensitive to the mid-west view on political issues” which was like a splash of blood in shark infested water for her. She comically veered the discussions into a commentary on health care reform, gay marriage, and marijuana legalization no matter what Dorn tried to do to stop it. On Saturday, we attended a Wil Wheaton Panel where the former Wesley Crusher himself lead a fun discussion about tabletop gaming, craft beer, and the perils of being a step-father. We ended up WAAAY in the back of the room for this and another panel so the picture that I am about to post will be tiny and awful. 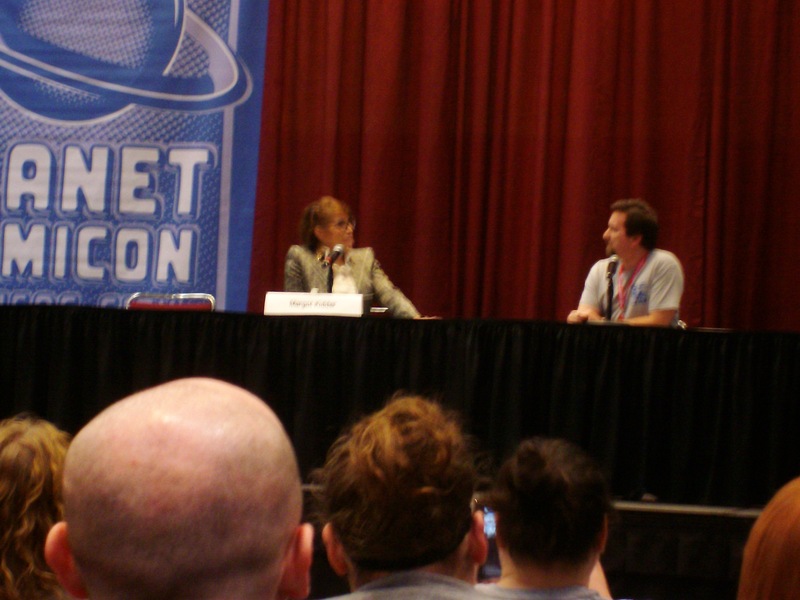 The best part of this panel was a “cameo” by Gates McFadden, introduced as “Space Mom”. As Trek fans will know, McFadden played Beverly Crusher in Star Trek: TNG, and was the on-screen mother for Wheaton during his time on the USS Enterprise. Since she didn’t have a panel of her own at this convention, it was cool seeing her appear in some capacity. This mysterious blur is Wil Wheaton supposedly. 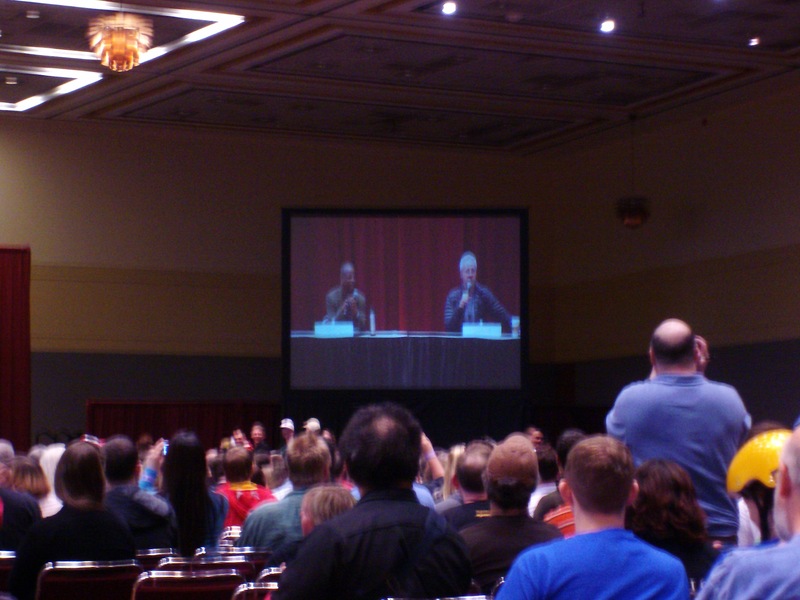 Next up was the Brent Spiner and Levar Burton panel, which had an ENORMOUS line waiting for it. We were actually scared that we wouldn’t be able to get in, but thankfully were able to get a few seats towards the back of the room. The panel started with Spiner having to deal with a rowdy “heckler” with a deep southern drawl yelling about how awful he was. Eventually security came in and revealed the “heckler” to be non other than Jonathan Frakes playing an obviously pre-determined joke of Brent. This was pretty great and really got the crowd going. Gates McFadden also made yet another guest appearance, and after that it was all questions! The hot topic seemed to be LeVar’s other popular role as the host of the popular PBS educational program Reading Rainbow. 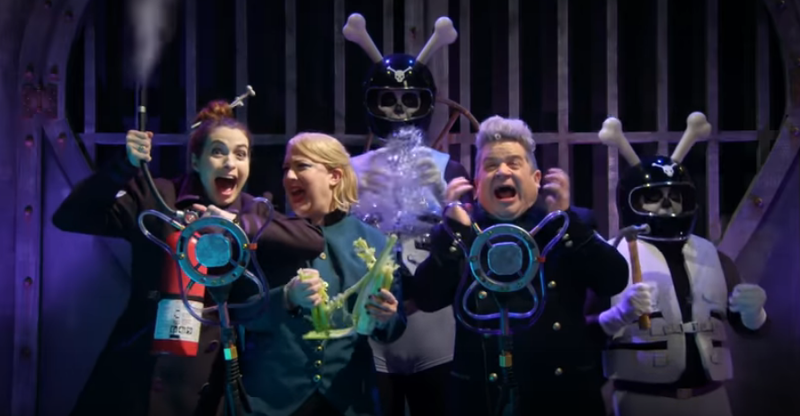 o many questions were asked about this that Burton had the audience sing the theme song, and announced a Kickstarter campaign was about to materialize to help fund internet video versions of the show for a new audience and a smartphone app. Brent pretended to be irritated by the attention, referring to Burton as “Roots guy” and discussed popular roles on Independence Day and a fictitious sequel to Star Trek Nemesis where Commander Data didn’t die after all. 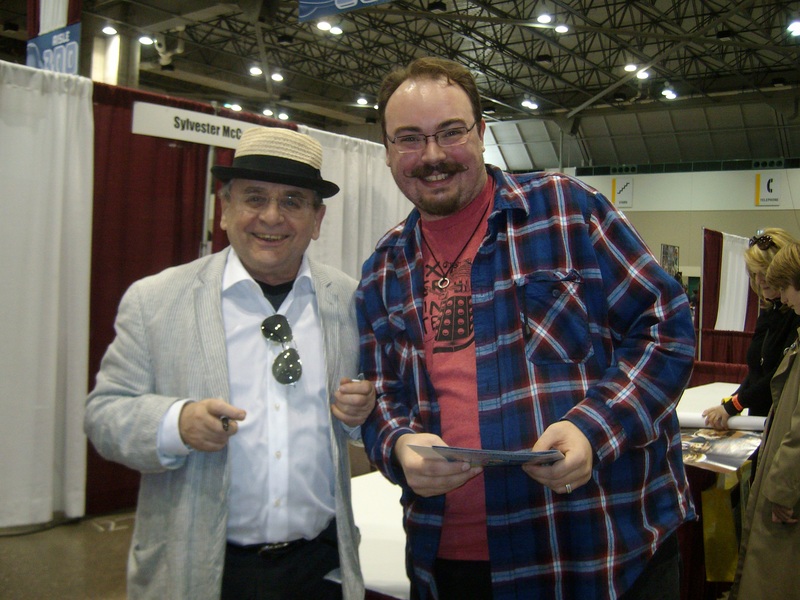 Perhaps the highlight of this con for me was getting to meet Sylvester McCoy and attending his Panel. The panel itself was simply amazing because he decided to forgo the stuffy rule of “guest sits in chair” and proceeded to walk around talking to the audience, hugging people and other things. I’m pretty sure that the guys from the Traveling The Vortex Podcast were probably annoyed slightly, because McCoy sort of moderated his own panel, but they were good sports. The panel itself appears to have been recorded as a podcast on their site, so be sure to check that out if you want to listen to the fun we had. Highlights of McCoy’s panel was an impromptu session of spoon playing on Darth Vader’s head and a kazoo heavy rendition of the Doctor Who theme to close everything out. My wife gets really nervous around celebrities, so she was freaking out a little bit about how close to everyone McCoy was. stories like his near foray into the priesthood as a teenager were delightful, and really made this the best panel I have EVER attended. 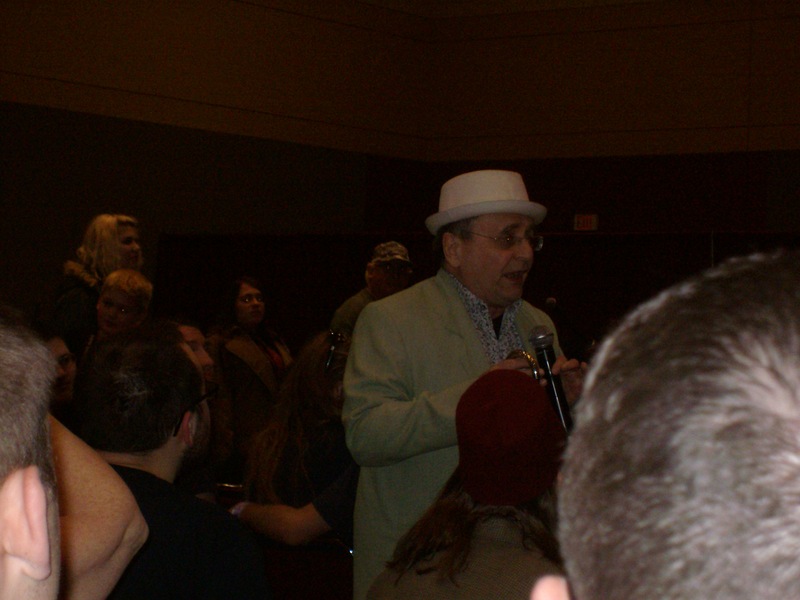 If you ever get a change to see Sylvester McCoy at a con or something you will have a ball. 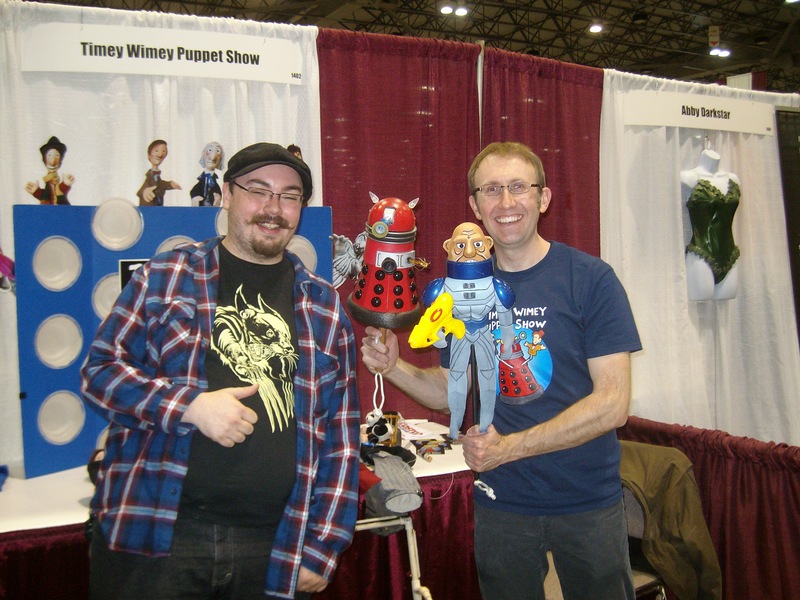 Another fun Doctor Who related event was a performance of the “Timey-Wimey Puppet Show” – a one man “Punch and Judy styled puppet show for kids and adults alike. I later got to meet the man behind the show, Mike Horner, and snap a picture with him. do yourself a favor and watch a few of his videos on YouTube up there, it’s pretty funny. The highlight of the puppet show for me was a segment where cosplayers we asked to come up on stage for a rendition of “Twelve Days of Christmas” featuring regenerations of The Doctor, and there was a little boy, no older than five, dressed as William Hartnell. He was even a master at holding his lapels and looking surly. This was a crazy weekend here is Kansas City because this convention, Big 12 Basketball, some sort of marathon, and a symphony performance were all scheduled at the same time within a few blocks of each other. Not only did that mean crazy traffic, but it also meant that parking was awful, and way too many people from Kansas and Iowa (due to basketball) were all over the place. If I have only one complaint it was that the city could have staggered these events a bit. Thankfully another convention, Naka-Con (an anime convention) was over the state-line in Kansas or it would have been too much to deal with. I do have a funny story about the parking situation this weekend. On Saturday, we had TONS of trouble finding a parking space. Many of the bigger garages were at capacity, and many were resorting to shady stuff like parking at Denny’s to avoid high fees. we eventually found a nearly empty garage a few blocks away in “the art district” and jumped at the opportunity to get a place to stop at a cheaper price. Not only did we discover that a nearly-vacant parking garage is sort of creepy, but the whole thing had “artsy-fartsy” minimalist music piped into it that sounded like a combination of a didgeridoo and someone scraping metal on the ground. To me, this was the soundtrack of hell itself, and I imagined that we’d soon witness Pyramid Head from the Silent Hill franchise walking around a corner at any moment. Had I thought this out, I would have attempted to record this for the site, but I wasn’t sure I’d even discuss this in any way. I haven’t had this much fun at a convention for a LONG time. For a while I always had something spoil the whole thing for me: whether be someone we came with getting cranky, annoying kids, or poor management. There is basically nothing bad I can say about the con itself, and I’d recommend this experience to ANYONE into comics or other nerdy “pop-culture” things. Planet Comicon has won me over, and they better expect me there for years to come! If any of the footage from the panels surfaces online (I think it was recorded by the con staff) I will try to post it on here at some point, but otherwise listen to that podcast up there for a taste of what Sylvester McCoy had to offer. 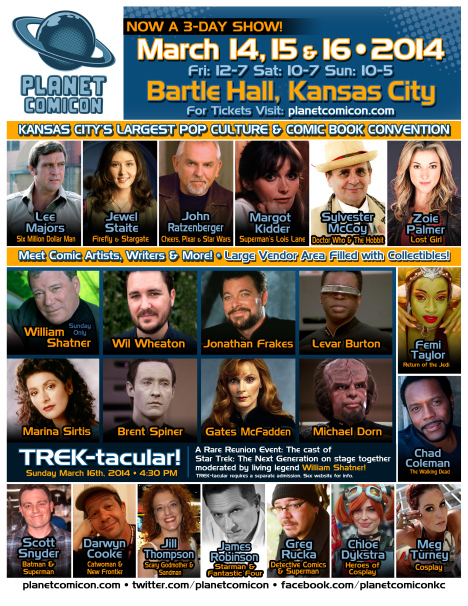 Planet Comicon is excited to announce a once-in-a-lifetime opportunity in Kansas City! 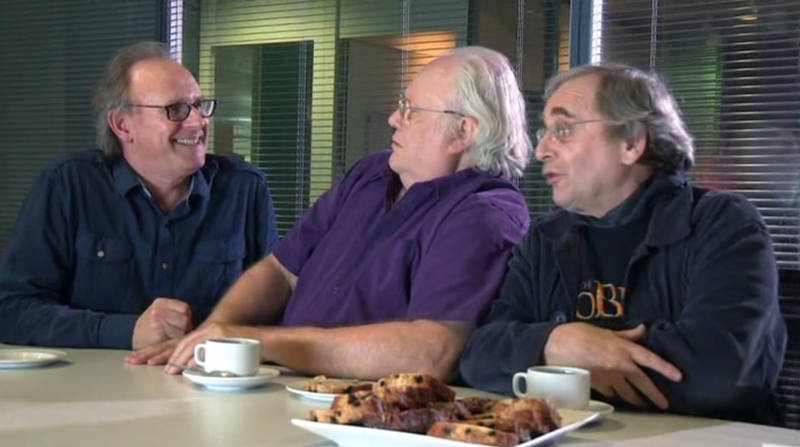 Sylvester McCoy Confirms The Master in Series 8, But Who Will Play Him? ‘Doctor Who’: Is a major villain returning in Season 8? 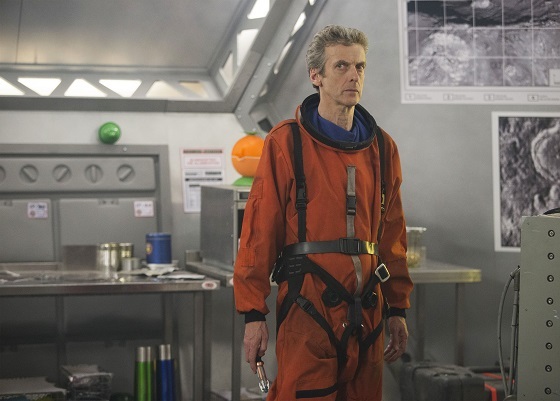 DOCTOR WHO: Has Season 8′ Major Villain Been Revealed? Author Stephen K.Posted on March 14, 2014 March 14, 2014 Format ImageCategories Doctor Who, Site AnnouncementsTags BBC, Doctor, Doctor who, doctorwho, Hobbit, Master, Planet Comicon, Seventh Doctor, Sylvester McCoyLeave a comment on Look Who I met Today! Rather than clogging up your blog “reader”, I figured I’d post some videos that I’ve been meaning to mess with all week. I’ll try to post something else this weekend, and move away from 50th anniversary stuff for a while. I still need to watch the much derided “BBC after party” that is so spectacularly bad it’s hilarious and a few more specials (like the one from Big Finish), so they’ll be on here eventually, but maybe not in the next few days. On nineteenth Century Earth artist Edvard Munch hears an infinite scream pass through nature. Centuries later his painting of that scream hangs in a gallery on the barren dust world Duchamp 331. Why is there a colony of artists on a planet that is little more than a glorified garage? What is the event that the passengers of the huge, opulent pleasure cruiser ‘Gallery’ are hoping to see? And what is hidden in the crates that litter the cargo hold? The Doctor’s diary indicates that the painting is about to be destroyed in ‘mysterious circumstances’, and when he and Ace arrive on Duchamp 331, those circumstances are well underway. 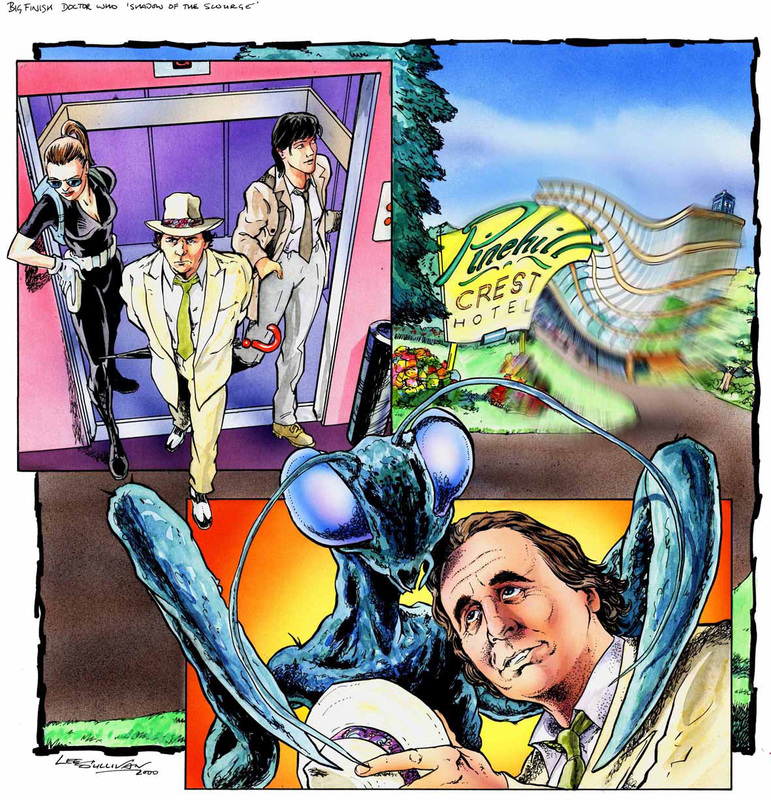 Anyone keeping up with my Big Finish Audio reviews will recall that I generally feel that the Seventh Doctor stories based on the Virgin New Adventures line of books are …. not my cup of tea. I worried that this one was in that particular series, but was pleasantly surprised that it was not. 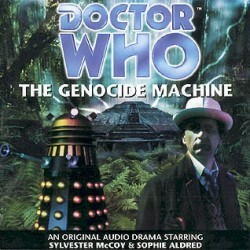 Luckily I’m glad to report that this particular entry in the monthly line of audio dramas is in continuity with an earlier entry called The Genocide Machine and not The Shadow of the Scourge, the former being an entry that I quite enjoyed; the latter not so much. Containing The Doctor as played by Sylvester McCoy (soon to be in a Hobbit film near you!) and Ace, as played by Sophie Aldred, this adventure seems just like a continuation of the original show, just if it lasted a bit longer. One of the major strengths of this drama is the great cast within. There are a few questionable choices, as is usually the case with a lot of these early plays, such as a weird accent used by Caroline John, but the direction here is usually spot on. McCoy does great as The Doctor here, playing the role in such a way that it lines up far closer to the way the role was performed on the television show, not the yelling angry style found in the aforementioned “New Adventures” plays. 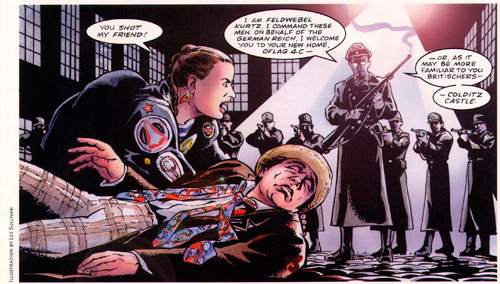 Louise Falkner appears here as a Captain Jack-esque tertiary companion named Bev Tarrant, a character that previously appeared in The Genocide Machine. Above and Beyond, the highlight of this play (for me at least) was the return of the Master as played by Geoffrey Beevers. Beevers previously held the role for a short time at the end of Tom Baker’s tenure on the main show, and was portrayed as somewhat of a walking corpse teetering on death at the end of his regenerations. Fairly early on, we are introduced to a wealthy man named Mr. Seta who wears an extraordinary jewel covered mask and is a bit less than trustworthy. Of course “Mr. Seta” is just another one of The Master’s playful anagrams of his own name, a fact that The Doctor should really pick up on at some point. Granted, his plan is ridiculous, and his regression back to his previous iteration (Anthony Ainley was very ill at this time and did not want to participate) is not very well explained, but it was nice to see Beevers do the role for a bit longer than he did in the past. I’m no Ainley hater, but the role was a tad silly when he was playing it, and Beevers adds the darkness back that was originally there with the first Master as played by Roger Delgado. The plot has some silly, or convenient moments, and the main villain of the piece wasn’t all that spectacular but all in all this was a good listen. Little touches like a droning noise that sounds like a screaming Dalek in the background really makes Duchamp 331 a planet to be truly feared, and helps sets this play above merely “average”. I loved the Master in this, had he not been present I’m not sure if I would have liked the final product nearly as much. For me, Big Finish dramas with the McCoy Doctor have been hit or miss, but this one was a nice surprise. 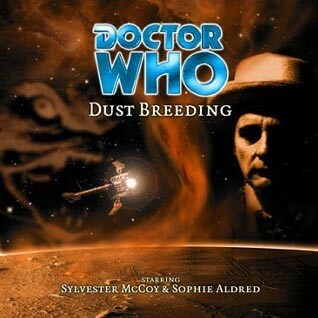 While not an official Big Finish release, I decided to go ahead and listen to this short mini-drama starring Sylvester McCoy as the Doctor. 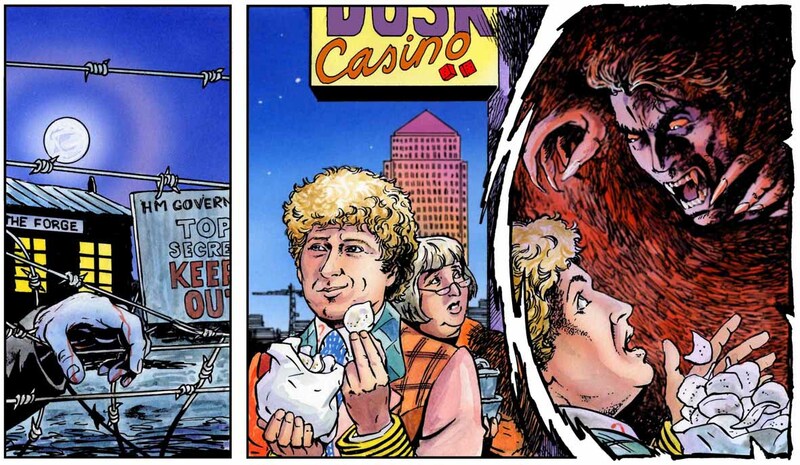 This drama was originally released for free bundled with issue 300 of Doctor Who Magazine. I managed to check it out due to the fact that it was split up and released via Big Finish’s weekly podcast back in 2009. According to Wikipedia this was originally a story called Vilgreth, released by a small company called Audio Visuals a long time ago. These guys were amateur audio drama / Video producers that eventually moved on to be part of Big Finish and BBV Productions. Due to the limited run-time of the piece, and the fact that it was intended to be a free pack-in, I tried not to listen to this audio drama too harshly, but it still sticks out as one of my least favorite things that Big Finish has done. It’s not that the drama is written poorly, or that the production is bad, it’s just that I don’t like the main narrative device that is used – It’s from The Doctor’s perspective. I don’t mind hearing the Doctor talk to himself, or rationalize out loud, but having the whole thing in first person is not my cup of tea. If the character is to be mysterious, sometimes irrational, and full of questionable alien morality, hearing his inner thoughts sort of kills the whole thing. This structure also lends itself to a situation where the whole production reminds me of a children’s book. I’m not sure why exactly, but despite the dark nature of the story, the whole thing seemed immature. Last of the Titans does what it was set out to do very well, although it is leagues below the quality of its “big brothers” in the main Doctor Who line. If anything, all this drama made me want to do is check out the stuff that Audio Visuals did “way back in the day” as I was unaware of their existence until I read up on it. Summary: The Pinehill Crest Hotel in Kent is host to three very different events: a cross-stich convention, an experiment in time travel and… the summoning of the scourge. The Doctor, Bernice and Ace find themselves dealing with a dead body that’s come back to life, a mystical symbol that possesses its host, and a threat from another universe that’s ready for every trick the Doctor’s got up his sleeve. This time, has the Doctor gone too far? As I stated in my last “quick review” with the darker Doctor Who styling, The Fearmonger, I need to try harder to separate these stories from that of the rest of the cannon. Not that they are bad stories, but I have pre-conceived notions of what tone the show should be in that sort of interfered with that drama. This time I decided to listen to a story based on the Virgin New Adventures line of Doctor Who books. For those unaware of the term the VNA novels were released after the show was put on “indefinite hiatus” by Michael Grade, the much beguiled BBC controller in the late eighties. 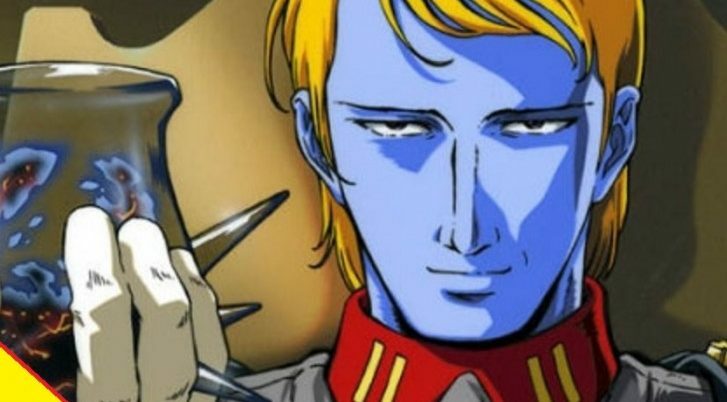 Throughout the nineties, a series of books was released that put a darker tone to the stories, painting Ace as a soldier, and the Doctor as even more manipulative than ever. I also got my first introduction to Bernice Sumemrfield, a 26th century archaeologist that traveled with the Doctor and Ace during this time. This play introduces a new villain in, The Scourge, a multidimensional creature resembling a huge praying mantis, which dwells and thrives off of uncertainty, doubt, self-loathing, and depression. They are found to do this by sonic means, so we get a rough scene where ace has someone box her ears to rupture her eardrums. This does act as a sort of comic relief (something that is needed) as Ace now can’t hear what people are saying and constantly repeats things back to people. This play is VERY dark, almost Torchwood dark to be honest. I was actually quite surprised when the Scourge start disemboweling people, as the foley guys (I’d assume it’s called foley in radio as it is movies) came up with the most grotesque noises that they could in order to portray such as scene. We have many scenes of sheer emotional terror and anguish in this play as well with not only Ace, Benny, and background characters, but even the Doctor. This is possibly the most intense play, if not Doctor Who related media, aside from maybe Torchwood: Children of Earth, that I’ve consumed. While this sheer darkness is off-base for the TV show, I will concede that a darker take on the characters can be a bit satisfying as we get some real emotion from everyone involved, but it never reaches into the gratuitous side. The one thing that really kept me from really liking this storyline and rating it better than “average” is the crazy “minscape” section towards the end of the serial. The Doctor and Benny are literally sucked into the Doctor’s own mind as he tries to fight his own “scourge”. It is at this point that we elarn that depression and other doubts are basically from these creatures, and they have been praying on the weak humanity for thousands of years. The monster keeps repeatedly telling The Doctor some bad stuff like the fact that he is “merely a troublemaking child who fears being alone so much that he deliberately alienates his companions to see whether they’ll leave him or not”. This reminds me of the recent TV episode containing the Dream Lord, as you find out that the Doctor is pretty self-loathing sometimes. The Shadow of the Scourge was a decent episode of the Big Finish Audio dramas, and really reminded me of a Torchwood related item. I’m still not a huge fan of the dark nature of some of these, but at least the performances were VERY well acted. Note: I’ve skipped the last audio play as I need to re-listen to it. You know, I haven’t really seen too many episodes of Doctor Who with Mel, but I always hear that the character is annoying and basically terrible. Being an American, I don’t have all of the pre-loaded bias against Bonnie Langford, due to her status as a child star. This fact, I have noticed, has made her get picked at a bit on websites and such. In a similar case, I was unfamiliar with Billie Piper’s music career prior to her signing on with the show, and thus had no problems with the character Rose Tyler. I think some people get so engrossed with the “pre-Who” careers of some folks, that it harms their enjoyment of the show. Anyway, back to Mel; Mel isn’t really that bad at all! Even in the campy Delta and The Bannermen, she seemed like a decent enough character despite the screaming and running around she seemed to do. But wait – isn’t this a review of a Doctor Who audio book, and not a career retrospective of Bonnie Langford as Mel? Yes it is, and the above clarification is necessary, as I felt that this would be one of the worst audios due to the characters inclusion, based solely on other people’s opinions online. Guess what? I loved it! The story opens with a strange discovery in a collapsed archaeological site in Italy. It seems that an Earthquake has opened the ground near the site of the former city of Pompeii, revealing a blue police box in the rubble. We jump to The Doctor and Mel arriving at the same site in 79 A.D., one day before the “big day” at Mt. Vesuvius. Mel is worried that the Doctor seems pre-occupied and won’t let them run out and do their normal explorations on the amazing scene they are witnessing. The truth is, the Doctor knows about the Tardis being found there, and he’s worried that today is the day that he finds out why. It’s no secret that I love historical episodes, and this one did not let me down. A similar episode of the show during the David Tennant run as the tenth incarnation of the Doctor relied way too much on aliens and other trappings of the “modern historical” in Doctor Who, but this is straight historical. There are no aliens and no monsters just a story of one man’s quest to divert what he believes to be the inevitable – his death. Sylvester McCoy and Bonnie Langford do a great job in the roles of The Doctor and Mel, and show a great chemistry together. While not as popular and dramatic as McCoy and Sophie Aldred were as a team, this pairing gets the job done, and harkens back to an older era in the show. 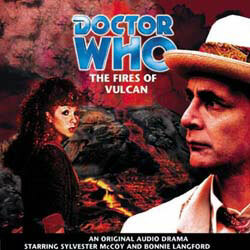 The Fires of Vulcan is probably one of the better Big Finish audio plays I’ve heard so far, despite all the fan hate for me. I for one, hope she has done more of these! 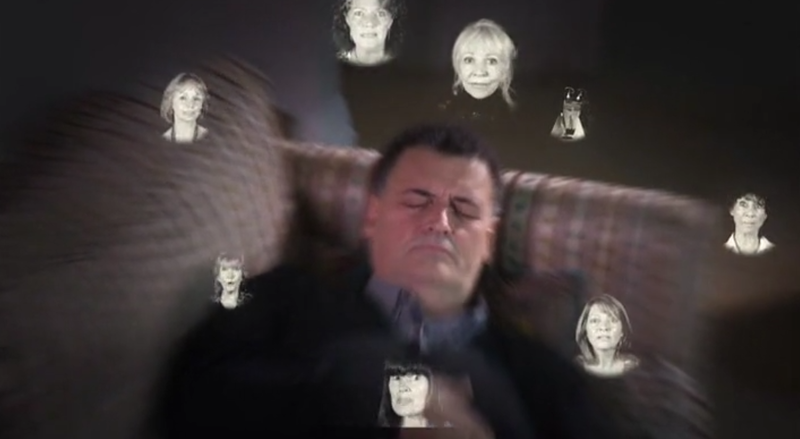 As I mentioned in an earlier post, the Doctor Who charity special, Dimensions in time, is a pretty rough experience. On one hand, this charity episode was released way back when the show was off of the air, so any sort of new material was welcomed by fans. The main problem was, that somebody over at BBC decided it would be an amazing idea to have this episode as a crossover with a popular soap opera called The Eastenders. 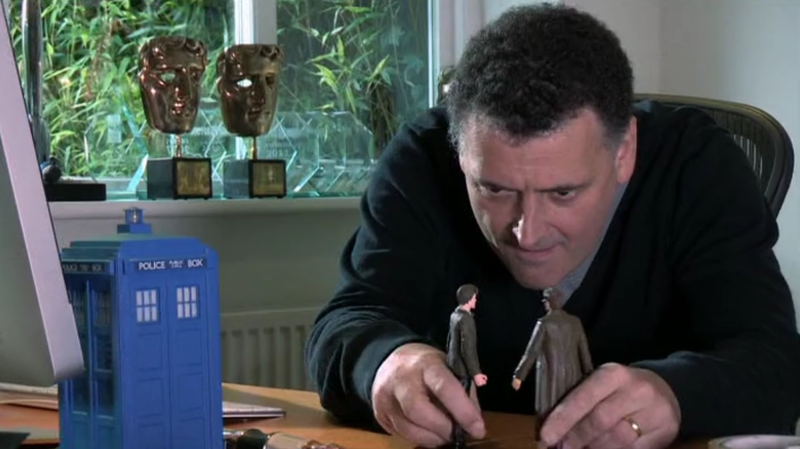 Confusing casting decisions were combined with a few miss-steps like having all of the remaining Doctors appear in the video despite having only the smallest interest of picking the role up. This is especially prominent with one Mr. Tom Baker who, despite a good performance aside from the fact he is sitting in front of a green screen talking into a microphone, obviously didn’t want anything to do with the 30th anniversary special. The other actors all tried very hard to salvage what eventually became of this, but sadly it was a losing battle. Mayday, mayday. This is an urgent message for all the Doctors. It’s vitally important that you listen to me for once. Our whole existence is being threatened by a renegade Time Lord known only as the Rani. She hates me. She even hates children. Two of my earlier selves have already been snared in her vicious trap. The grumpy one and the flautist too. She wants to put us out of action. Lock us away in a dreary backwater of London’ East End. Trapped in a time-loop in perpetuity and her evil is all around us. I can hear the heart beat of a killer. She’s out there somewhere. We must be on our guard and we must stop her before she destroys all of our other selves. Oh… [gives a pained look] Good luck, my dears. I’ve included that up there, because it is literally ALL the story we actually get in this episode, the rest is a mess of random appearances and nonsensical babbling. This whole thing is moved along by use of the Rani’s gun that can alter time, a convenient way to have multiple Doctors show up. Sadly the way this occurs is VERY jarring as the Doctor phases between identities, sometimes in mid-sentence, and way too frequently. While it starts out being the Seventh Doctor and Ace talking, every time we hear a noise and the screen flashes we meet another version of the Doctor, sometimes another companion, or someone randomly from Eastenders. While one can figure out what is supposed to be going on, the whole production looks as if it cost something like a tenner and maybe a drink at a bar. There are some good things to be seen from this episode, however, as it marks one of the very last TV appearances by Jon Pertwee before he died only a few years later. He had stopped doing much acting to my knowledge and was touring around on the science fiction convention circuit and doing small roles in dramas and such. This episode also sees the only meeting between the Sixth Doctor and longtime companion and all around awesome dude – The Brigadier. Aside from those good things, I can’t explain enough how bad the episode is. When I had tried to get hold of all of the Doctor Who stuff I presumed would not be released on DVD like missing episode reconstructions and charity specials, I was happy to find an off-air recording of this. This happiness was surely dashed once I actually watched the dreary mess. If anything, this special was not a send off for the beloved show that was believed to be laid to rest forever, but a sad remembrance of the crappy state of the show’s production in the later 1980’s. Doctor Who was to have its day in the sun once again, and come back stronger than ever…sadly it was not on this day! Ah yes, the first Dalek-related audio drama Big Finish has produced. Being a huge fan of the little squid-like hooligans, I was excited to see – errr – hear what the audio format had for these guys. This begins a story-arc of sorts that Big Finish has labeled Dalek Empire; it will contain four separate stories with different Doctors held together by the common theme. This segment follows The Doctor and Ace as they are humorously brought to a planet called Kar-Charrat in order to return a library book, lifted from a library where such things are frowned upon. At the same time we cut to another group led by a person that is almost like a “semi-companion” in Bev Tarrant. Bev is a female Han Solo of sorts, and plans to steal a large ziggurat in order to make it rich. Too bad the Ziggurat is full of evil squid monsters surrounded by armor – the Daleks. After the last McCoy and Aldred play, I was worried that the overly dark nature would spill into all of their plays. Thankfully that isn’t the case, as this play seems more in-line with the show than one of the books. 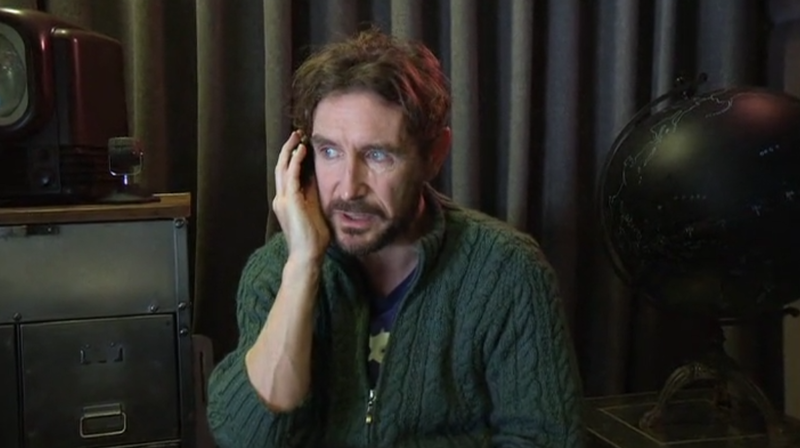 That is the great thing about Big Finish, if you don’t like a certain play, the next one will be completely different, and may strike your fancy. I enjoyed the plotline and dialog; yet felt that it was bit too preachy in some regards, especially when you find out the atrocity the librarians on Kar-Charrat have committed. Without giving away the plot completely, let’s just say that the overtly hippie-like nature of Avatar is pretty close to the mood the audio sets. The audio only really fails on the insanely contrived plan that the Daleks have hatched. While they are known to have ridiculous over-thought plans in the past, this one is pretty over the top. They basically plan to use the libraries knowledge to create a super Dalek with the power of the Universe, so they plant cryogenic sleeper cells on every planet of this one particular system that also contains the aforementioned “secret” library. I say “secret” because everyone seems to know of it. 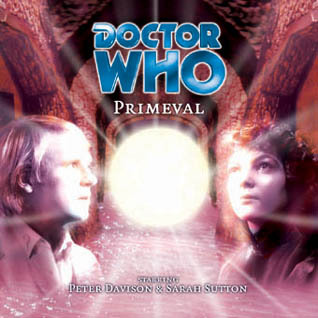 Plot aside, this was a fun audio adventure, and a blessing of what to come for Sylvester McCoy stories. Synopsis: One would-be assassin is in a mental ward. Another’s on the run. Their intended victim is stirring up the mobs. Terrorists are planning a strike of their own. A talk-radio host is loving every minute of it. A Whitehall insider whispers about a mysterious UN operative, with a hidden agenda. Everyone’s got someone they want to be afraid of. It’ll only take a little push for the situation to erupt – and something is doing the pushing. But you can trust the Doctor to put things right. Can’t you? One of the things that I have yet to actually get around to doing is reading any of the Doctor Who: Virgin New Adventure books produced in the early-mid nineties. I do know that conceptually I do not agree with the general tone of the books based on what I’ve seen, and some of the fandom that came from them. As a first “true” introduction to the format, these plays based on the Virgin New Adventure books, are equally as problematic to me. 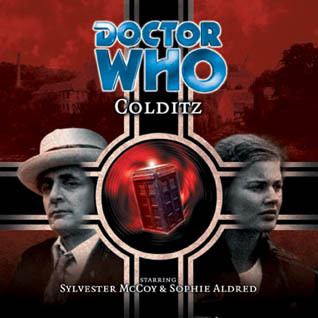 The actual audio drama that I am looking at reviewing here is called the Fearmonger and stars Sylvester McCoy and Sophie Aldred reprising their roles from the latter era of the original series. Immediately we find The Doctor and Ace hot on the heels of some kind of monster that may or may not inhabit the body of a crazed right wing political group leader. At least this is what a man who regularly calls into a Fox News styled pundit show seems to think, and says that he plans another assassination attempt on her, as a previous one (that the play opened on) went south. We find the Doctor commandeer the radio show and egg on the “crazy” man, basically saying “yeah! There is a monster” which riles everyone up. This leaves Ace and the Doctor to investigate the situation themselves in order to get some answers. The right wing political party in question, The New Britannia party, is a pretty rough group of characters who base their entire political stance on racism. They basically want to throw out anyone who isn’t white and sherilyn Harper, their leader, doesn’t help with her rhetoric. Against them is a terrorist group trying to end the hate ironically with assassinations and bombings. Immediately you may notice that the back-bone of this story is very dark, and that is honestly a big problem with it for me. While things like nationalism, jingoism, racism, immigration and politics have always featured in Doctor Who media, the show was at least clever enough to try to keep it toned down. With this new tone, the storytelling loses its fun and clownish charm, instead going for preachy social commentary. This was a trend in the 1980’s McCoy episodes as they ham-fisted things like racism into episodes that did not need it in the plot. Remembrance of the Daleks comes to mind with a few scenes of black segregation in the 1960’s that served no purpose other than to make the watcher feel bad, and cluttered up the over-all narrative. This bleak and preachy take on the Doctor is not my favorite to be honest. I guess it may be my problem as a listener, that I need to differentiate the show and these audios more in order to really enjoy them, but as a fan of the classic show rather than a series of books, the themes in here clash with my preconceived notions of what the characters should be doing. Aside from my gripes, the acting and production on this play are VERY well done, and to be honest it is the best produced play from Big Finish so far. I know my opinions on the McCoy era may not be the most popular, but I will try to look at the other Virgin New Adventure stories with a more open mind. We’ll see how that goes. While the acting and sound effects are really good, the plot in The Sirens of Time is unnecessarily complex at times and seems to be full of stuff that does not move the storyline along very well. Earlier this year, I decided to take the plunge and start listening to a line of audio dramas from a UK based company called Big Finish. Living in the U.S., we really don’t have audio dramas at all whatsoever, so I was not too sure if I would like them at all. Gladly this was put to rest, as my experience with these is largely positive. 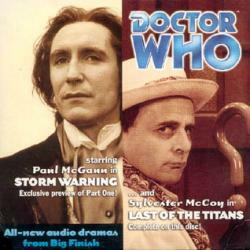 The first one I listened to was also the first Big Finish audio drama made that was officially licensed by the BBC. 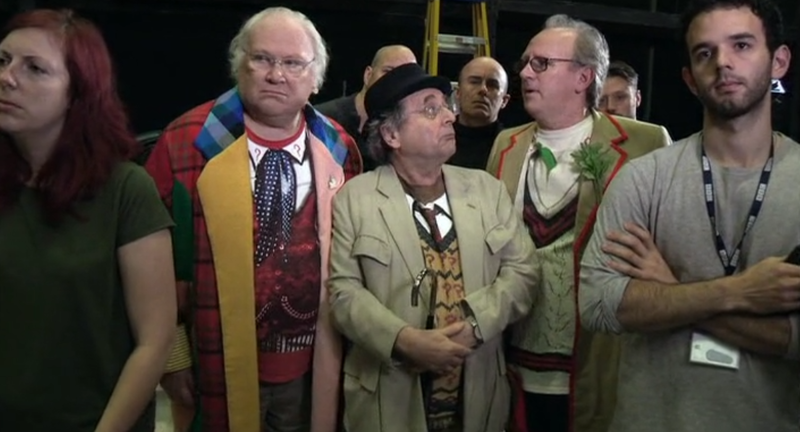 Starring Colin Baker, Peter Davison, and Sylvester McCoy all at once The Sirens of Time promised to be a crazy ride. Multi Doctor stories are generally not nearly as good as one would think they would be, as they generally come across as ‘fanwanky” and nonsensical. Take for instance the 80’s TV episode The Five Doctors in which everyone looks to the Doctor’s first incarnation for some sort of wizened advice from time to time, despite the fact that the Doctor was younger and less experienced than the others. Luckily The Sirens of Time escapes this fate a bit, but still comes across as a little thin storyline-wise nonetheless. The story involves an invasion of Gallifrey, the Doctor’s home planet,by a warmongering race called The Knights of Velyshaa. The Timelords release that someone or something is meddling with time and forcing three different incarnations of the Doctor to mess time up in some way in order to create this militant army. Terrified by this prospect, the Timelords try to take measures to kill the Doctor so he can’t do the deed he is being tricked into doing. The fifth Doctor is revealed to be stuck on a German U-boat in WWI, unable to re-enter his Tardis to go home. The Sixth Doctor is on some kind of conference ship where a group of dignitaries and scientists are investigating a spatial anomaly known as the Kurgon Wonder. And the Seventh Doctor is in a jungle of some sort, where he saves a young girl from dying only to end up meeting a reformed war criminal on the run from android assassins. While the acting and sound effects are really good, the plot in The Sirens of Time is unnecessarily complex at times and seems to be full of stuff that does not move the storyline along very well. As a one shot story I feel that the episode is very “middle of the road”, but as a “sampler” of sorts for the next few dramas that were planned, I can see why this was made in this way. All in all I liked The Sirens of Time, but better audios were to come.